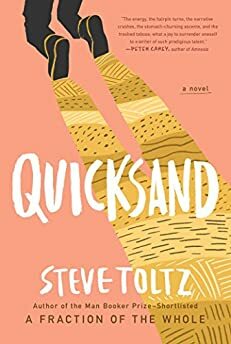 Largehearted Boy: Book Notes - Steve Toltz "Quicksand"
Book Notes - Steve Toltz "Quicksand"
Steve Toltz's Quicksand is one of the funniest (and most heartfelt) books I have read in years, and its antihero Aldo Benjamin is unforgettable. "Toltz channels a poet's delight in crafting the perfect phrase on every highly quotable page. In his epic lack of employment and sincere lust for life, Aldo Benjamin is quite a memorable character. By turns hilarious and hopeless, Toltz's novel is a tender portrait of a charming and talented loser." I have been playing Oscar Peterson's Night Train on a near-continuous loop since March 1992, when I had to write my first university essay – it was still playing around April of this year when I finished the last edits on Quicksand. At first I considered just listing the whole album as the playlist, but there are songs whose lyrics fanned the flames of ideas contained within the novel, and shine a little light on why I wrote about them in the first place. As a side note, the video for this song is a perfect short film that echoes themes within my novel: a man lying on the pavement physically paralyzed by some horrific truth, and who winds up paralyzing all who listen to the truth he tells. This wouldn't even be in my top 50 TMBG songs but its topic is simply too apt for Quicksand. My protagonist is a paraplegic named Aldo Benjamin, and the novel examines, in some detail, the trials of this particular unfortunate physical state. May I direct your attention to the following simile? There is no way to repair the break. Oh, they may just impale you on railings. It's a crime this French absurdist pop singer isn't at least as well known as Bjork. My favorite song of hers tells the tale of a woman who finds an elephant in her shower, an elephant who just wants some nougat. Fine. For some unaccountable reason though, I'm always (nearly) moved to tears when she calls the police, and they tell her to solve her own problems. This is just the kind of institutional indifference that Aldo avoids by having a friend in the police force. Throughout the novel, Aldo struggles with not just how to live, but whether he should live at all. When I share my bed with a boy, I tell myself, I'd prefer to sleep alone. and realize I should've had vegetarian. In the novel, it is revealed that Aldo is a character that, "comes from a very specific line that passed on very specific fears from generation to generation: fear of unraveling rope bridges, fear of causing an avalanche by sneezing, fear of accidentally procreating with a half sister, fear of being shot in the face by a hunter—"
Being lured by a diamond to his death is just the type of thing that might've happened to Aldo, or the type of random fear that might keep him up at night. Quicksand is very much about artists, inspiration the muse, resisting the muse, turning away from and exhausting the muse. These very things seem to have also been on Bob Dylan's mind when he wrote this song. Teenage Aldo goads his new best friend Liam into throwing a party while his parents are away, and that party grows a little out of control: "people were stamping like horses trapped in a burning barn. Etiquette seemed to dictate putting cigarettes out directly on the coffee table rather than into the burgundy Persian rug. There were guys and girls piggyback jousting, kicking in sideboards, mowing the carpet, trampolining face first into the wrought-iron chandelier, pouring turpentine into the fish tank, pulling insulation out of the walls, and generally taking out their own puberties on the physical structures around them." In an Australian high school party in 1989, Midnight Oil, Cold Chisel, and AC/DC would be blaring, but at some point, everyone would have their arms over each other's shoulders and would be singing this classic ballad by Australian band, Hunters and Collectors. In my novel, the seeking of religion is what Aldo, an pathological entrepreneur, turns to in order to make his fortune. Alright, I'll admit it: this is stolen from my three-year-old's playlist. It's from Disney's 1967 movie, The Jungle Book, and is sung to the boy Mowgli by the Monkey King, who feels he has peaked as a monkey, reached the summit of monkey-experience, and wants to learn to walk, talk, chew like a person, as well as learn the human secret of making fire (Give me the power of man's red flower/So I can be like you). There is no book I will ever write that could not have this song on the playlist.